ABOARD USS GEORGE H.W. BUSH — As the Navy looks at shaking up its deployment patterns to become more responsive to world events and more unpredictable to adversaries, one key benefit may be more time available for high-end training closer to home. Navy deployments tend to be governed by a 36-month Optimized Fleet Response Plan cycle of maintenance, training, a regularly scheduled seven-month deployment and then about 15 months of being ready to surge forward if needed or maintain readiness at home. However, Richardson said this week he believes OFRP and dynamic force employment are complementary ideas rather than opposing ones, noting that OFRP creates ready forces and he’s simply looking to use that readiness in new ways. “What we’re talking about is, once that readiness is generated, what do we do with that naval force? So I see it as being very complementary to the OFRP, injecting dynamic maneuver to naval forces at sea. I think these two are not in conflict at all,” he told reporters aboard USS George H.W. Bush (CVN-77) at sea on Monday. If OFRP was already generating ready naval forces, Richardson is now interested in using dynamic force employment to create more naval power with those forces. 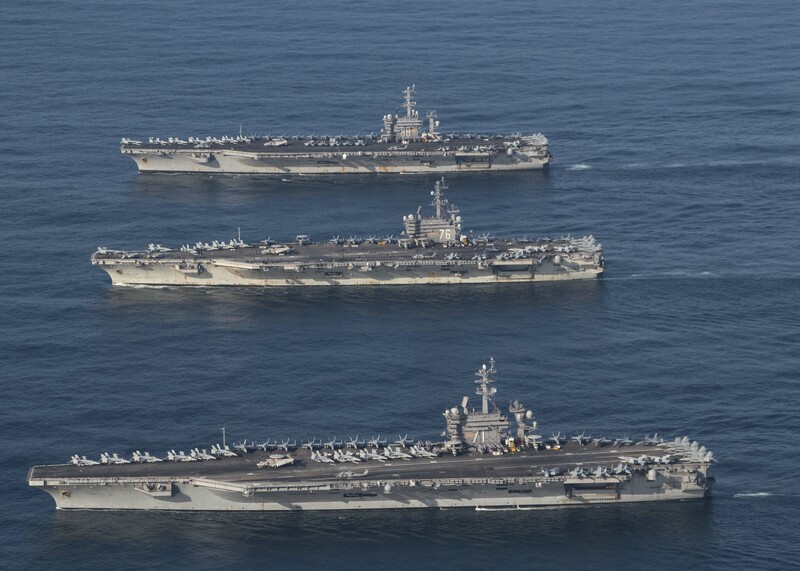 “If you think about all the ways you could increase the power of the Navy, it’s not necessarily going forward, disaggregating the strike group and doing those sorts of operations,” he told USNI News later in the day on Monday. The Navy has conducted several multi-strike-group operations in recent years, though not all have been able to operate at the high-end of warfighting. 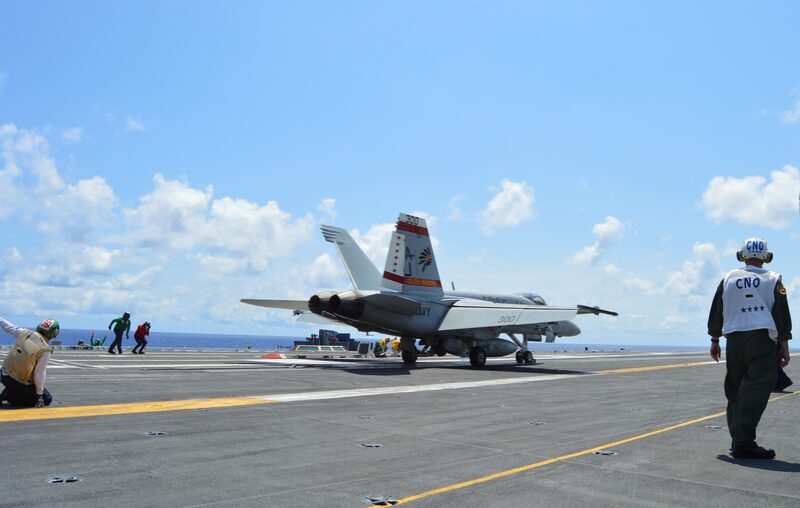 Three carrier strike groups met in the Sea of Japan in November, but USNI News reported they were not able to practice sophisticated maneuvers together due to being so close to Chinese forces. “It’s an aspect of the security environment that it’s getting harder to do things without being observed, no matter where you are. So we’re going to have to be clever about that,” Richardson told USNI News. If trained and certified carrier strike groups were to spend less time disaggregated overseas providing presence and working with allies and partners on lower-end operations, and instead devoted more time to training together to advance warfare tactics, Richardson argued, that would contribute to increasing naval power. Chief of Naval Operations Adm. John Richardson watches an F/A-18E Super Hornet from the “Golden Warriors” of Strike Fighter Squadron (VFA) 87 launch from the flight deck of USS George H.W. Bush CVN-77) on May 14, 2018. USNI News photo. Asked about second and third order effects of the shift in how forces deploy – what it means for sailors’ families, what it means for ship maintenance and nuclear-powered aircraft carriers’ fuel consumption to potentially take more trips across the ocean but spend less time on station – Richardson said those considerations would be monitored as the Navy learns more about how the fleet can support new deployment patterns. “The logistics and the fuel consumption and all that stuff will have to be measured as we do that so that we don’t overextend ourselves in that regard, but I think there’s a lot of good that will come out of it,” he said. Richardson also said on Monday that the standup of U.S. 2nd Fleet – and the proposal to dual-hat the command with a new NATO Joint Force Command – would bring its own set of opportunities for operational innovation with allies. “I would imagine that we’ll get a fair amount of allied liaison officers on the (2nd) Fleet staff as well,” he said when asked how 2nd Fleet would compare to the other numbered fleets around the globe. Richardson argued soon after taking over as chief of naval operations that the Navy was facing a return to great power competition that would force the service to operate differently. He has since discussed the role of a distributed maneuvering force to counter adversary threats, and more recently highlighted agility as one of six elements of naval power. When the Pentagon released the National Defense Strategy in January, the same themes were present. “Be strategically predictable, but operationally unpredictable,” the strategy dictates.